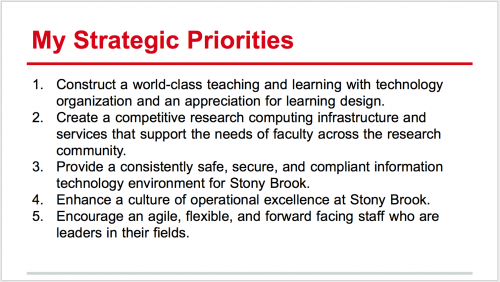 Today at 3:30 I will be addressing the Stony Brook University Senate. I was invited by Senate President, Dr. Fredrick Walters to both introduce myself to the Senate and provide a brief update. 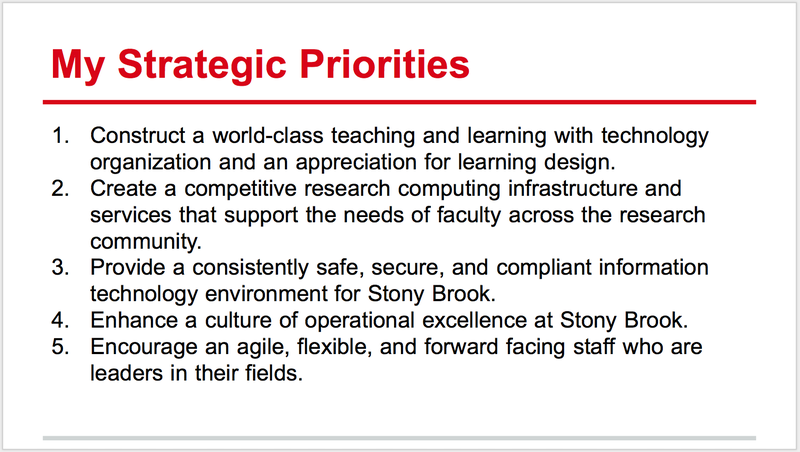 I don’t intend to spend more than 10-15 minutes talking, but will be sharing both my observations from the first 8o days here as well as my overall strategic priorities for DoIT. I think it will be interesting to see if there are questions afterwards … and know that I will either update this post or do another one after the fact. I am making an overt offer to attend department meetings and to invite the larger community to attend the Coffee with Cole sessions. Again, we shall see. At the end of the day, I am just honored to have the opportunity to represent DoIT and get to know our University Senate.